Stunning Turnkey! Designer interior that combines elegance & style. 150K plus in upgrades. Location, Location. 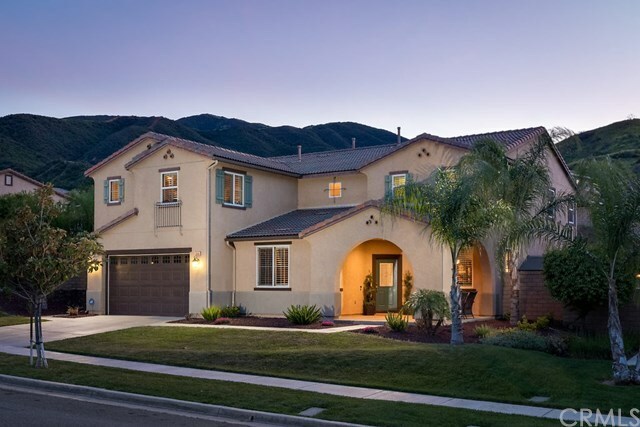 Located at the edge of Orange County and situated in the exclusive enclave of âOrchard Glenâ a coveted South Corona neighborhood welcomes nature enthusiasts, privacy seekers, and more. Surrounded by Cleveland national forest and Skyline trails this gem of a home has it all. This Centex built largest model sprawls 3875 sq.ft of living space on 10,000 plus sq.ft lot. Inviting and open-concept layout brings in plenty of natural sunlight that reflects meticulous attention to detail and exquisite finishes in every part of this majestic estate. Convenient Downstairs bedroom and full bathroom. 5 Bedrooms 4 bathrooms plus loft. Recessed lighting and shutters throughout. Ceiling fans everywhere including every bedroom & custom outdoor patio. Backyard is an entertainerâs dream. Custom outdoor kitchen & firepit connected to central gas, 2500 sq.ft plus stamped concrete all secured within three sided block wall. Master bedroom with mountain views include his & her walk-in closets, separate deep tub and stand-alone shower, dual sinks and much more. Gourmet âislandâ kitchen opens to living room with fireplace and boasts chandeliers, stainless steel appliances and sleek, white cabinets with molding. LOW taxes and NO mello roose. No HOA dues till end of 2019. Best schools and shopping minutes away. Commuter friendly. Quick freeway access to OC via newly built foothill extension.